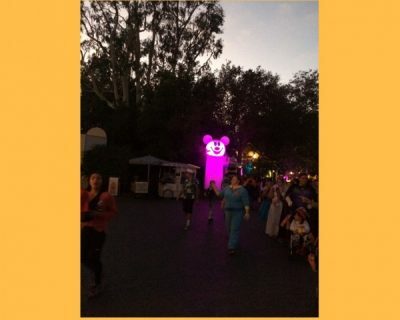 With a ticket, guests can enter the park up to three hours prior to the start of the party. 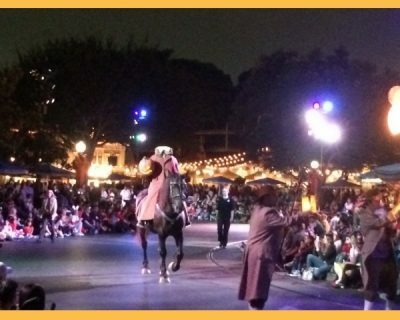 For example, our party ran from 7:00 p.m. until midnight, but we were able to get into the park at 4:00 p.m. This was our plan, but absolutely terrible traffic and confusing parking thwarted our plan. Even with these setbacks, we arrived well before the party started. 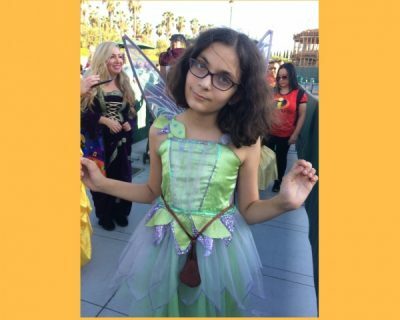 Guests of all ages are invited to wear costumes to the party, and some people go all out with some amazing costumes! There are restrictions on what you can wear, so be sure to check the official rules before planning your outfits. 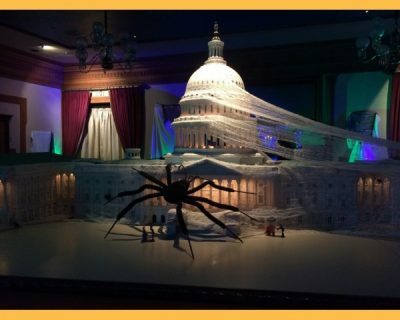 Even the interior of Great Moments with Mr. Lincoln got into the Halloween spirit! 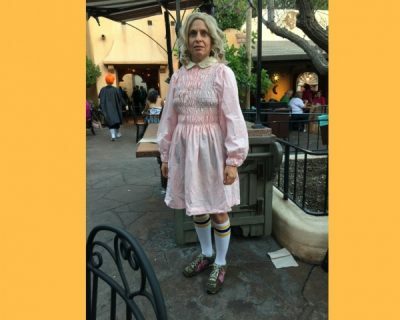 One note: for the first time, this year the rules stated that guests 14 and over were not allowed to wear costumes until the official party start time. Because of this, I opted to wear street clothes when we arrived and to change into my costume closer to party time. However, we saw many adults arriving early to the party in costume and all of them were admitted into the park with no trouble. 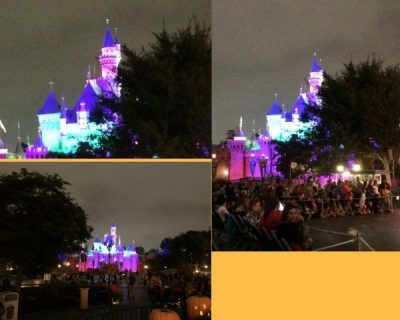 I was confused by this, so I checked the rules again, and the rule stating that guests 14 and older could not wear costumes until the official party start time seems to have disappeared! Not sure what happened there. 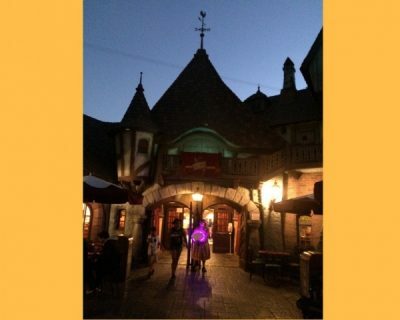 If you arrive early to the party and want to eat dinner before it starts, know that many quick service establishments close early since they are trying to clear the park of non-party day guests. 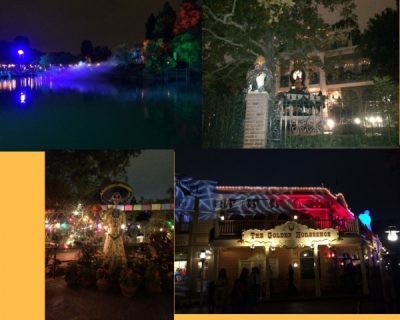 However, we asked a Cast Member which places were still serving and grabbed a nice dinner at Rancho del Zocalo. Once the party started, several quick service establishments were open, selling food and snacks, many with a Halloween theme. There is so much to do at the party that it’s impossible to do it all! 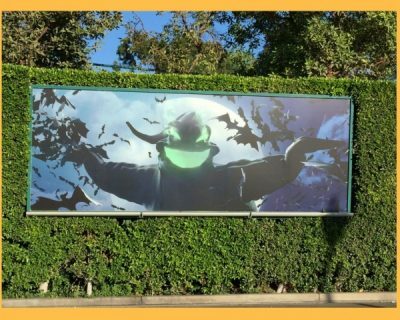 The entire park is decked out for Halloween, and spooky (but nothing truly terrifying) sound effects and music play everywhere. 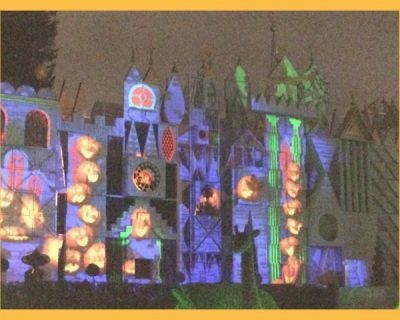 Disneyland has been playing a lot with projectors over the past few years, and lots of buildings, including most of Main Street, U.S.A., Sleeping Beauty Castle, the Golden Horseshoe, and it’s a small world, had spooky and fund projections on them during the party. One of the highlights of the party is that only a limited amount of tickets are sold, and many guests are here for the party, even though most of the attractions in the park are still running. Because of this, we were able to walk right on many rides. The only ride that appeared to have a long wait was the ever popular Haunted Mansion Holiday. 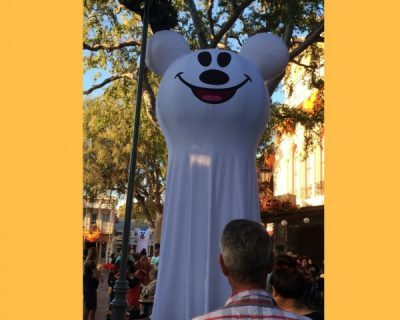 There are meet and greets with characters, the Ride of the Headless Horseman, the Frightfully Fun Parade (which was running twice during our party), the Halloween Screams fireworks, and the very popular Trick or Treat Trails. Every corner of the park was decorated! 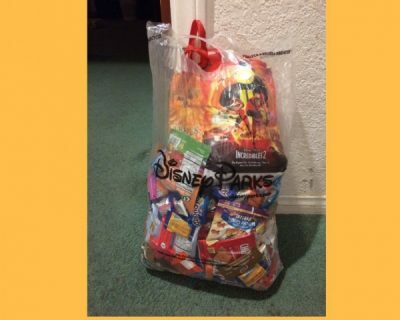 When you arrive for Mickey’s Halloween Party, all guests receive a treat bag. This year, the treat bag is themed to The Incredibles 2 and Ralph Breaks the Internet. You’ll also receive a map that shows the location of several treat trails scattered throughout the park. 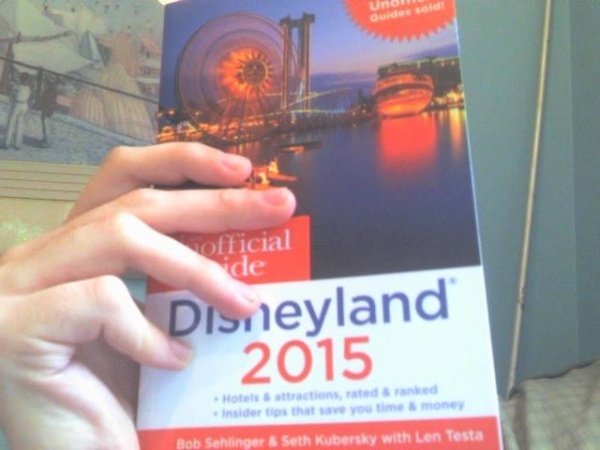 Some of these (the two on Main Street, U.S.A.) were tricky to find, so don’t be afraid to ask a Cast Member for help. At these stations, friendly Cast Members will give you treats! In addition to the expected fun sized candy, they offer pre-packaged cookies, chips, pretzels, dried apples, fresh apples, carrots, and rice treats. No one in my family has any food allergies, but there were signs at the treat stations saying that any guest with a food allergy should talk to a Cast Member. Apparently they stock pre-packaged allergy-friendly treats so that no one will be excluded. Two years ago, we came home from Mickey’s Halloween Party and placed our treat bags in the bathroom scale to find out we got twenty pounds of treats. This year, we got so many treats that a Cast Member suggested we go into a nearby store to get a clear plastic Disney parks shopping bag. We dumped all our treats into this and kept collecting. When we took our bag home and put it on the bathroom scale, it completely screwed up the scale and we had to reset it. So we don’t have an accurate number, but rest assured, we got A LOT of treats. Yes, this is our actual haul from the Party! 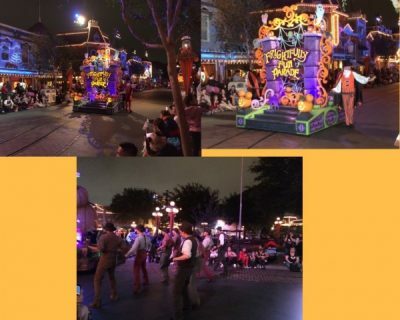 Try as we might, we couldn’t make it until midnight, and wound up leaving Mickey’s Halloween Party around 11:00 p.m. Still, we had so much fun and did so much! It was a perfect celebration! 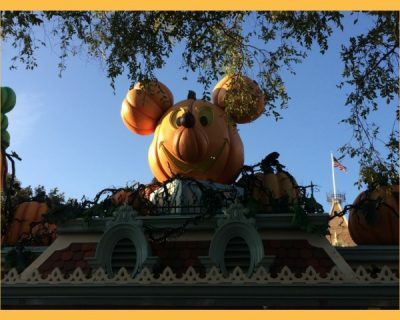 Have you attended Mickey’s Halloween Party? What tips do you have? Share in a comment below or on Facebook or Twitter. 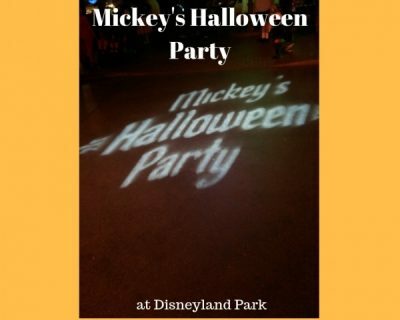 Want to attend Mickey’s Halloween Party at Disneyland? Contact The Magic for Less Travel for more information and a free, no-obligation quote. What a fun time. Thank you for sharing it with us.???? I am so glad we got to do it!